… a textbook for the printing industry. Trouble Shooting For Printers provides solutions to a wide variety of technical problems that can be encountered by printers during their everyday work. The book covers subjects ranging from paper, inks and consumables to pre-press, presses and finishing issues. The text is complemented by high-quality photography and images that help explain how to overcome adverse situations that are affecting productivity or quality of the printed material. ‘In 1988, while editor of the monthly magazine Inplant & Instant Printer, I had the idea of writing a text book that provided solutions to the technical problems that are commonly, and sometimes not so commonly, encountered by printers in their daily work. 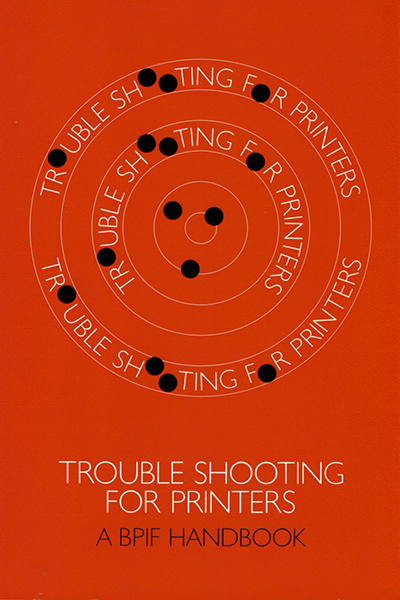 Two years later, having interviewed more than forty experts in various print related fields, Trouble Shooting For Printers was published by the British Printing Industries Federation.